Hi friends! Quick card to share with you today! I'm using the Just Thinking stamp set again, but I played with a different layout. If you have been following me you know that I like to try different things. So this is truly something different. 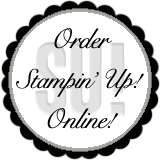 It's a layout that was shared by Shelli Gardner, the Cofounder and CEO of Stampin' Up!... I hope I did it justice! This layout really uses the Big Shot and it was perfect for this stamp set and the Window Frames Collection Framelits Dies. Isn't this a fun card and who wouldn't love receiving it in the mail? As I said I used the Big Shot, the Window Frames Collection Framelits and I also used the Square Lattice Folder, I used the En Francais stamp and used the Festive Paper-Piercing Pack.